and, the name of the rules that have been applied for messages. By default, CodeTwo Exchange Rules 2003 keeps statistics of Outgoing messages and is set to store messages for 30 days. To change these settings, choose Tools from the top menu, and click Statistics (Fig.1). Fig.1. Statistics in the Tools menu. 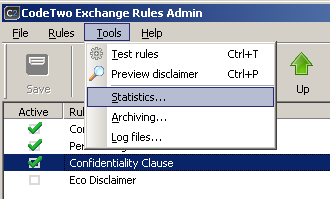 The Statistics dialog box will display (Fig.2) where you can configure this tool. 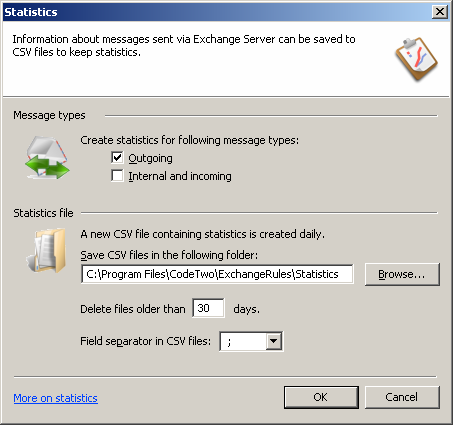 You can choose to turn on the statistics for one type of messages, both or none. The statistics tool does not distinguish between incoming and internal messages; they must be treated as one. A new statistics file is created daily. The file name format is YYYY.MM.DD.csv, where Y is the year, M the month, and D the day on which the file was created. This means that each day will have one corresponding statistics file. You can configure the tool to automatically delete old CSV file in Delete files older than option. Just choose the number of days you want the statistics to be kept. Field separator is CSV files option lets the user choose the character the program will use to separate data in entries. The semicolon is the default separator. The changes made to the statistics will become effective with the next processed message.